Idea Store Watney Market, which opened on Tuesday 14 May 2013, is based on three floors and offers a wide range of services. 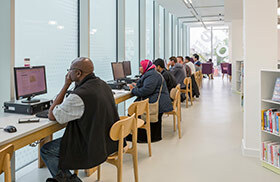 The £4.5 million Idea Store was jointly funded by the Big Lottery Fund and Tower Hamlets Council and includes an integrated One Stop Shop, where residents can access council services. It also provides adult, youth and children's library services complemented by a ground-floor space which hosts a range of community facilities, including advice on council and health services. Nearest DLR: Shadwell: Follow the signs to Watney Street Market from the station's entrance, as Watney Street turns to the right, continue straight on through the pedestrianised area until you reach Commercial Road. On your left is the entrance to the Idea Store Watney Market. Nearest Overgound: Shadwell: Take the exit for Shadwell DLR station, turn left onto Watney Street, as Watney Street turns to the right, continue straight on through the pedestrianised area until you reach Commercial Road. On your left is the entrance to the Idea Store Watney Market. For cyclists with their own bike, there are cycle racks in Watney Market. In Idea Stores and libraries you can book on our computers for up to three hours.